I must be honest, I had never even heard of Kinniku-Melt until I read a thread about it a week or two ago over at Little Rubber Guys. Apparently, Kinniku-Melt is some kind of chemical reaction that causes certain kinds of plastic to melt when they come into contact too long with the original Japanese Kinkeshi. I have always displayed my Kinkeshi on wood or metal shelves, so this phenomenon was news to me. In a strange twist of fate, I got my first taste of Kinniku-Melt when I ordered some dead stock Part 25 and 26 Kinkeshi from the Mandarake Microkan. As you can see in the pic above, Geronimo's noggin has used it's Choujin powers for evil and melted straight through the surrounding capsule plastic. 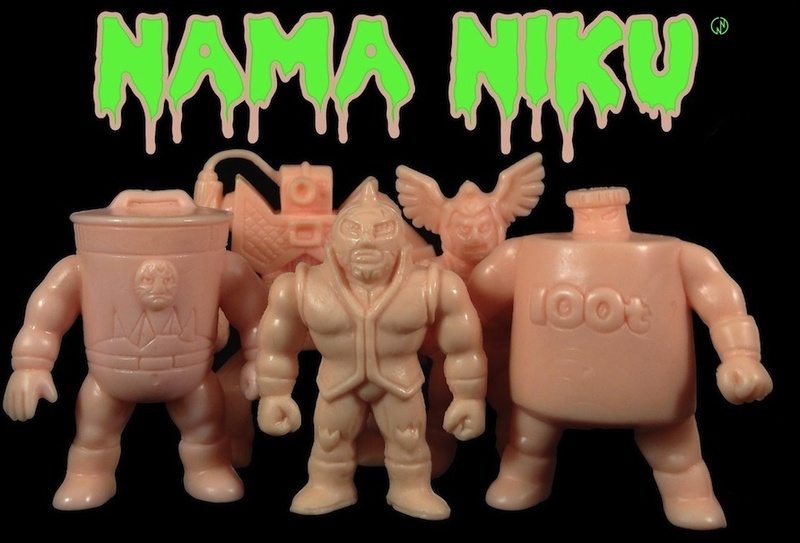 Kinnikuman also went to town melting this capsule, but to my surprise the Kinkeshi inside were are still in mint condition with no damage applied to the actual figures. Kinkeshi 3 - Capsules 0.